TheSea Lion Bowl Diversity Initiative is currently seeking funding. If you are available to fund this program please contact us. 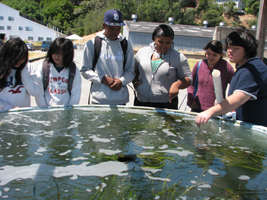 The Diversity Initiative is a program designed to increase ocean science awareness among under-represented communities and to foster a more diverse population of students pursuing marine oriented careers now and into the future. To qualify, schools must consist of at least 40% African American, Hispanic, Native American and/or Native Pacific Islander students, or identified as lower income by the Department of Education. The Diversity Initiative aims to benefit not just a team of 5 students, but an entire class, club, or school, with educational resources, field trips, and mentoring. After three years, Diversity schools are expected to be self-sufficient in marine science instruction. 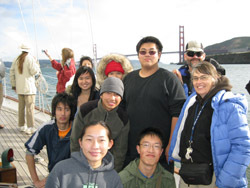 For the 2012 Sea Lion Bowl at San Francisco State University, three schools participated in Diversity programming: Oakland High School, San Lorenzo High School, and June Jordan School for Equity. Mentors, field trips and educational resources were made available to assist teams in preparing for the competition on March 3, 2012. Competition buzzer systems and textbooks were also be made available for competition practice. The 2010 Diversity Initiative was made possible through funding from the Miranda Lux Foundation and the Dennis & Carol Rockey Fund. The 2011-2012 Diversity Initiative is made possible through funding from the California Coastal Commission‘s Whale Tail Grants Program. This program is in turn funded by sales of Ecoplates. Get yours today to support marine education programs like ours! To learn more or to receive an application for the Diversity Initiative, please contact us.